Dash cameras use memory cards (also known as SD cards) to store the video footage they record while you drive. Memory cards vary in the amount of space they hold, and some dash cameras can take much larger memory cards than others. Whatever a dash camera films is converted into a usable file type and downloaded onto the memory card as a series of smaller individual files. These individual files can be reviewed at a later date on the camera itself or your computer, phone, or other electronic device. Measurements of SD cards are always given in gigabytes.Most dash cameras on the market today can accept cards up to 32 GB. Some advanced cameras can accecpt SD cards up to a whopping 128 GB. To give you an idea about how much footage this equates to, a 32 GB SD card recording in standard 1080p can hold roughly4 hours and 45 minutes of driving time. Depending on the quality of your recording, files can take up more or less space on your memory card. Lower quality footage means you can hold more footage until the card gets full. Higher quality footage mans bigger files, which will take up more space on the card. But what happens when a dash camera memory card becomes full? Let’s assume a memory card can hold up to five hours of footage: what then happens to that extra, potentially crucial footage, when you have a six-hour road trip ahead of you? Fortunately, it’s almost become an industry standard that today’s dash cameras come with what is known as loop recording or continuous recording.Loop recording means that whenever your memory card reaches full capacity, the dash camera will continue to recor, rewriting over the oldest files first so that there is never a break in footage. This is a crucial feature of any dash camera worth buying. Since you never know when an incident is going to occur, the last thing you want is for a memory card to run out of footage and then miss the very incident you bought the camera to record in the first place. While it is rare to find a dash cam today that doesn’t come equipped with loop recording, this isn’t to say that they aren’t still out there. To save you the time and hassle of researching which of the best dash cams come with loop recording, we’ve put together our list of favorite loop recording dash cams below. The best of the industry is listed here so that you can spend your time worrying about something more important. Take a look at our list and you’ll be sure to find a loop recording dash cam that suits your budget and fits your needs. What are the Benefits and Drawbacks of Loop Recording? 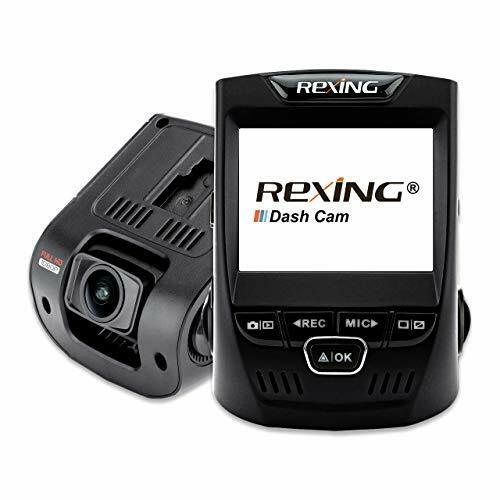 The Rexing V1 is a great dash cam that films in full HD 1080p and comes with loop recording. The unique design of the Rexing V1 means that it stays hidden within the vehicle (and to prying eyes outside) and the WDR technology means that it functions especially well in low light situations. The Rexing V1 also comes with a 170-degree fish eye lens so you capture more of the road in front of you as you drive. The Rexing loop-recording feature allows you to set the camera and forget about until you need to review footage. Under the dash cam settings you can choose to adjust this setting to record in loops of 3, 5 or 10 minutes long. 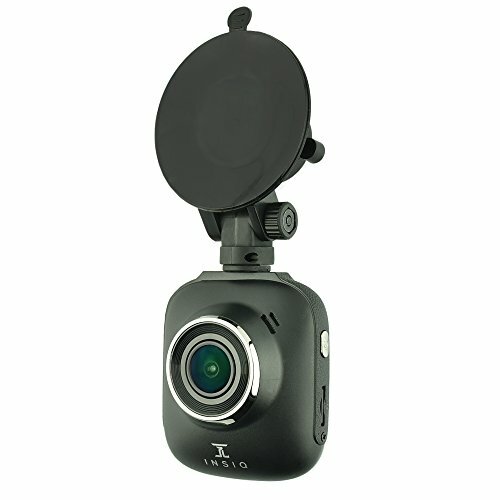 The ETTG is another good dash camera with a loop recording feature. Offering an alternative design to the Rexing V1, the ETTG attaches via suction cup to your car’s windshield and can be positioned as you please within the vehicle. Like the Rexing V1, the ETTG films in 1080p and comes with a wide-angle lens which captures 160 degrees of the road, slightly less than the Rexing V1. The ETTG also comes with GPS technology and G-sensor technology that locks and saves files that contain a potential incident. If the G-sensor technology detects unusual movement or vibration within the vehicle, it will lock the video so that the loop recording feature won’t accidentally record over the important file in question. The Z-Edge like the ETTG is an excellent loop recording dash cam that attaches via suction cup. It films in exceptional quality, in super HD at 1296p, a higher resolution than the other two cameras on this list. At 1296p, the Z-Edge is sure to give you a crisp, clear picture each and every time you film. The Z-Edge comes with ignition detection meaning it turns on and off when the car does. Like the loop recording feature, which allows you to customize clip length to 1, 3 or 5 minutes, you can adjust the Z-Edge how you want it and then forget the dash cam is even in the car. As it works its magic,the Z-Edge captures 145 degrees of the road in front of you,though it should be important to note that it does not come with GPS capability. If GPS is something you are looking for in a dash cam, you will have to look elsewhere. The INSIQ AW5, like the Z-Edge, films in super HD at 1296p and 16 megapixels. What that means is that you’ll be getting a picture so clear, you’ll never have to worry about missing an important detail like a license plate or the facial characteristics of a driver who may have done some damage to your vehicle. The INSIQ AW5 also has superior night recording capabilities, ensuring your vehicle stays safe day or night. The INSIQ AW5 is a little camera that packs powerful punch. While it boasts some of the best recording capabilities on the market, the INSIQ AW5 itself is small and discreet for a high-end dash cam, making it less likely to be stolen by thieves. The other benefit is that it accepts SD cards up to 64 GB meaning more footage can fit on your card before it begins to get written over. The extra space is good if you want to capture a long road trip in its entirety, or need to film the full length of training session with a driver of a new company truck. The OldShark is a more economical alternative to the other loop recording dash cams on this list. It films in HD at 1080p at an extra wide angle of 170 degrees, meaning nothing escapes this camera as you drive. The built in infrared lights of the OldShark get you good quality footage even at nighttime. The loop recording feature begins automatically as soon as the vehicle is set up, recording footage automatically and seamlessly whenever you drive. Perhaps the most enticing feature of the OldShark is the large 3-inch LCD screen. This scratch resistant screen allows you to playback footage directly on the device instead of having to remove the SD card and watch the footage elsewhere, like on a computer or tablet. Instead of this hassle, use the OldShark’s LCD screen to edit and send on your videos right on the spot. 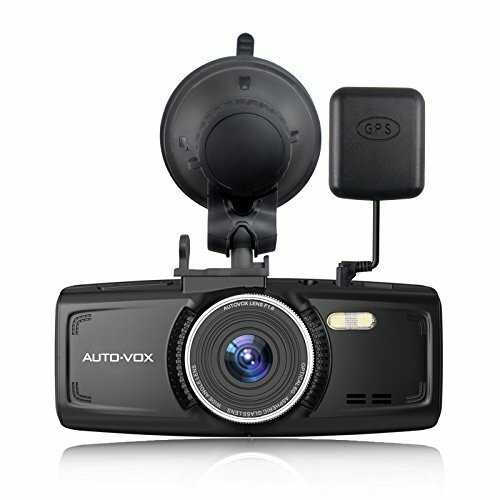 The AUTO-VOX is an attractive, alternative design to the suction cup adhesive of most of the dash cams on this list. Instead of a suction cup, which can lose suction over time, the AUTO-VOX can be affixed to the rear view window of your car so it hides out of sight and out of mind. The AUTO-VOX boasts superior recording quality at 1080p and the 170 degrees of wide-angle recording means you’ll never have a blind spot in your footage. The covert and discreet AUTO-VOX is powered by a capacitor rather than a built-in battery. This means that it can function in extreme hot or cold temperatures without problems related to overheating. If you live in an extremely hot climate, the AUTO-VOX might be the dash camera for you as it can withstand heat up to 140 degrees Fahrenheit. The Smarson loop recording dash cam is one of the most economical options on our list, but that doesn’t mean it should be overlooked. 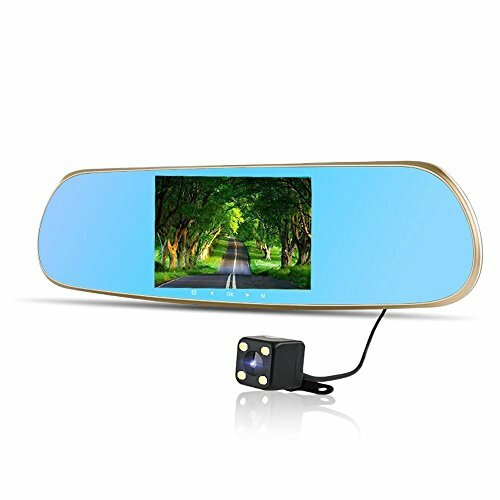 It too can film in HD and while the fish eye lens is not quite as wide as some of the other dash cams on this list, at 140 degrees you still get an ample view of the road and beyond. 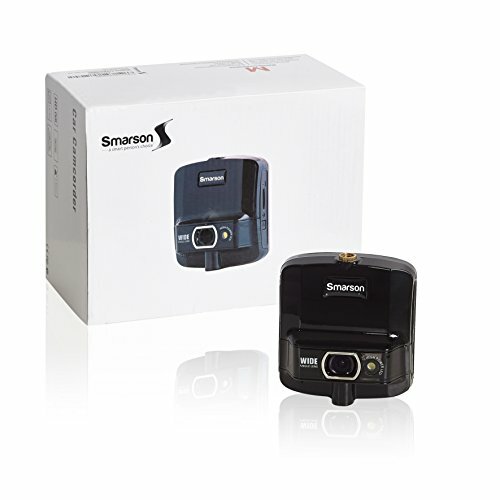 The Smarson also comes with G-sensor capability that locks any important files so that they are not lost when the loop recording begins to rewrite over old videos. All in all, the Smarson is a straightforward, easy to use dash cam that may not come with all the bells and whistles of some of the other high-end options on the market, but will still get the job done. The Accfly, like the Smarson, is an economical choice for those looking for a dash cam with loop recording. The 170 degree wide angle lens comes with WDR processing technology which means it automatically makes up for harsh glare in the daytime and low lighting at night to provide you with a quality recording no matter the conditions outside. 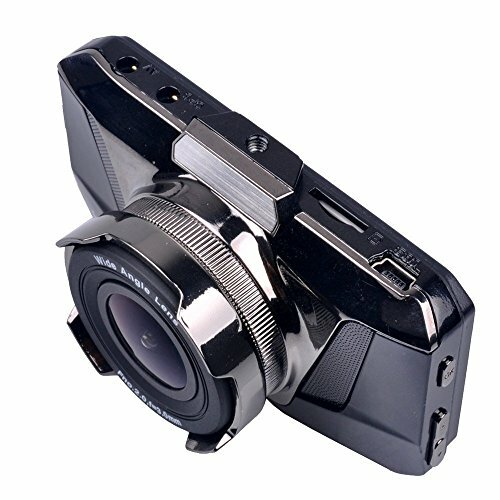 The Accfly dash cam also boasts a 2.7 inch screen and a special battery that is embedded and protected by the camera body. This feature protects against extreme temperatures, which could result in the battery overheating, leaking or catching fire. 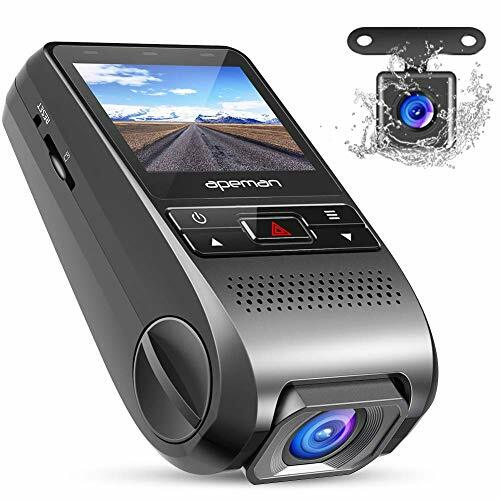 The Haopooner is the first dual channel dash cam to be featured on our list.With two cameras recording simultaneously (one facing the front, one facing the back) this means you can film the exterior and interior of your vehicle at the same time. The rear cam also keeps an eye on the back of your car, which is important to consider as accidents occur at the rear of the car just as much as they do at the front. Think of someone bumping you in a parking lot or running into you at a stop sign. Boasting GPS technology, the Haoopooner allows you to track your previous routes as it connects through Google maps. You can even watch a live recording of your car from a computer. This could prove especially useful to concerned parents of new drivers or if you are loaning your car to employees to run errands. With the Haopooner you can make sure you’re employees are where they say they are at all times. 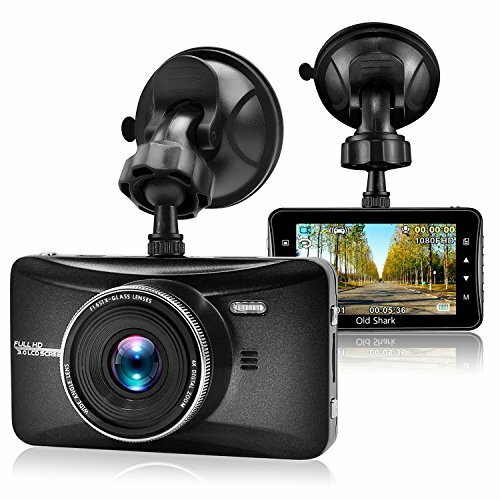 While heavier and larger than some of the other dash cams on this list, the Haopooner is built in a unique, cylindrical design that allows the lens of camera to be adjusted twenty degrees up or down. All in all the Haopooner offers the most comprehensive protection and guarantees both ends of your car are covered by high quality recordings. The 2.7-inch LCD means you can watch, edit and upload footage directly onto the camera itself and the all-important loop recording feature makes the need to take out and replace SD cards a thing of the distant past. The Apeman dash cam is our final option for loop recording dash cameras on this list. Along with the Haopooner, it is the only other dual channel dash cam, meaning it can film both the front and back of the vehicle simultaneously. A lens knob on the side for the device allows the user to position the camera exactly as they please, guaranteeing the perfect shot each and every time. Up, down, left, right, the adjustable front camera records in full HD in170-degree wide angle, whereas the back-facing camera has a slightly lower resolution at 640×480. The design of the Apeman is closer to the AUTO-VOX than the Haopooner. Small and discreet, the Apeman can be attached directly to the car behind the rear view mirror so no suction cups are needed. Also comes with advanced G-sensor protection so no files are lost in the loop recording if the camera detects unusual vibration within the vehicle. The Ragu loop recording dash camera is priced more or less the same as the OldShark. The Ragu dash cam itself is tiny and super lightweight, weighing in at a mere 7 ounces. Its attractive chrome design adds an aesthetic quality to what could otherwise be an obtrusive device. The Ragucan even act as a parking monitor for your car when hardwired to the vehicle directly. The loop recording feature of the Ragu works as it does in the other dash cams on this list by rewriting over oldest files first. It then ads new videos once the card reaches full capacity and does this indefinitely. The settings on the Ragu dash cam allow you to choose a video clip length of 1, 3 or 5 minutes. The Napoer is a loop recording dash cam whose body resembles a point and click camera. Filming in 1080p, the Napoer will make sure you capture important details on the road like license plates and road signs.The Napoer also boasts quality night vision capabilities so that no matter what time you’re driving, the Napoer has you covered. The lens always captures a full 170 degrees of the road meaning as the camera records you get more bang for your buck. The Napoer can also be used as a parking monitor when hardwired to the vehicle. The parking monitor function gives you added protection when you step away from your vehicle. When the camera detects an unusual vibration in the parked car (let’s say someone backs up into your car in a parking lot or kicks your vehicle) the Napoer begins recording. Night or day, in motion or at a standstill, the Napoer watches over your car at a fraction of the price of some of the other dash cams on this list. The obvious benefit of loop recording is that you don’t have to buy multiple SD cards or switch out a full SD card for a blank one while you’re driving. This kind of maneuver could not only prove to be an enormous distraction to a driver, but also makes it difficult to know which footage is where. With loop recording, you only ever need one SD card. That one card will contain all your footage in one easy to find location. Another benefit of loop recording is that most drivers are only interested in viewing footage that contains some kind of road incident. If there is an accident, you’ll want the footage – if you received an unfair ticket from a cop you’ll probably want the footage to protest the citation in court – but all the other footage, driving the kids to school, the endless miles of freeway footage, waiting at red lights, pulling into parking lots – are for all intents and purposes useless to most drivers. The benefit of loop recording is that you don’t have to manually go into the dash cam and delete the files you don’t want. Instead, the loop-recording feature does this for you. The drawback of this of course is that unless you buy a dash camera that can hold large SD cards, you’re always going to lose some footage at one point or another. But even with the biggest SD card out there, if you are someone who drives every day, at one point or another you will have to rewrite over old footage. This typically isn’t a problem, but if you are hoping to capture the full length of your 10-hour road trip, you will have to either buy two SD cards and switch them out halfway, or record in lower quality so that more footage can fit on the card. Continuous loop recording keeps the newest files on the card and records over the oldest ones once it reaches full capacity. But how does it work exactly? First we need to know how the camera is saving footage on the SD card. Instead of one mega-file which contains every moment of footage, what the camera does when it records is split the recording into a series of smaller files (between 1 – 10 minutes) until the SD card becomes full. If you look at the settings within your dash cam you will find loop recording options which will give you the ability to choose the length of these small video files.If the setting is at 1 minute, then once the card reaches capacity, the first 1-minute file recorded will be deleted and a brand new 1 minute file will be added to the list of files. Loop recording or continuous recording is a feature that no dash cam owner should go without. Not only does it save you the hassle of deleting unnecessary footage, it also means that you’ll never miss an incident on the road. Since one never knows when something worth recording is going to occur, it’s vital that the camera work at all times without the input of the driver whose attention should always remain on the road in front of him and her. 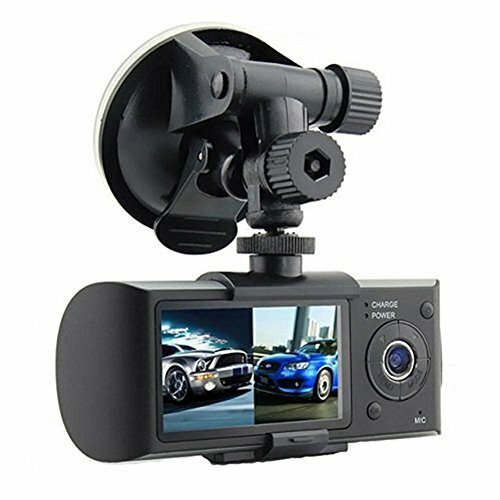 When selecting a dash camera with loop recording, it would be wise to take a look at what kind of SD cards the camera can support. If the camera can only support SD cards up to 16 GB, this means that only a relatively small amount of footage can be written to the card before old footage gets taped over. Conversely, if the camera can support SD cards up to 128 GB, a great deal of footage can be recorded to the card without fear of old footage being taped over. It’s also important to note what resolution the camera is filming in. Higher resolution means the file size of the videos will be larger. Lower resolution means the file size will be smaller and so more footage can be taped to the card. If you find that you are reaching the end of the SD card too soon and files are being written over before you have a chance to review them, lower the resolution of the footage you record. If you find that the footage you record is not sharp enough and you are rarely coming to the end of your tape, increase the resolution and make an effort to review footage more frequently. With that said, almost every good loop recording dash came also comes with G-sensor technology. The good news is that even if the dash cam does record over old footage before you have a chance to review it, if the dash cam recorded an unusual movement or vibration in the vehicle as it was creating a file, that file will be locked permanently so that it cannot be written over until the user deletes it manually.